Burt and I had to go to Las Vegas on business– the magical glittering town’s ad campaign advises “what happens here, stays here”, but, for me, it’s simply not possible to stay too long. Two nights is just perfect, I think. It was dark when we flew out of Oakland– but getting there was filled with the kind of terror you feel when you’re on time and then you’re really late. Traffic was terrible and we couldn’t figure out why until at the airport exit there was an injury accident and the most fire engines I have ever seen. We thought we were on the last flight out and calmed ourselves by being cool, Well, whatever happens, happens.” In reality, of course, we were gritting our teeth. With minutes left to get to the Southwest gate we sprinted out of the car and into the terminal, with one piece of carry-on luggage and this small but ancient, heavy suitcase that we had to bring. Luckily a uniformed woman directed us to a security checkcpoint that had no business. We were getting a break but I forgot to wear shoes I didn’t have to remove and in my rush I forgot to put the carry-on on the conveyor belt thingy, all of which made me and everybody else dizzy. Here we are with no minutes to spare and we learn that our gate is the last gate in the terminal and while the carry-on can be rolled, we’ve got this heavy old suitcase that has to be hand carried. What a nightmare. At the gate the ticket-taker said, “We were about to give your seats away.” We were the last pair to board, with seats at the very back of the full plane. But we made it. “You can see how long it’s been since I’ve traveled,” Burt quipped. Next to us sat a young Irish fellow who had lived and worked in San Francisco for seven years. In Vegas he was meeting the rest of his large family, siblings and mother who lived in Dublin–they had never seen the eighth wonder of the world and he wanted to be there to enjoy their reactions. We talked about Ireland because I had heard there was a big real estate boom, with housing prices skyrocketing, and Chinese restaurants on every block, and, in general the economy was prospering due to high tech. He confirmed all of the above but cautioned that the prosperity wasn’t benefiting everybody–it was a bit picky. Most interesting to me was that he said he never wanted to go back and live in Ireland. He visited the place of his birth a couple of times a year but he said he loved America. An hour-and-a-half later we landed in Vegas. We got in the taxi line which was moving fast and the dark skinned, very muscular looking guy wearing two earrings in front of us captured our attention. “Are you a wrestler?” Burt asked. “I used to do cage wrestling,” he said. “You’ve got the look,” Burt said. Burt and I looked at each other. He didn’t look like a pencil pusher. The wrestler-pencil-pusher-bounty hunter disappeared into a cab and so did we. Our trip to Vegas was turning into a movie. On the strip where imagination rules the building of hotel-palaces and gambling casinos, there is an incredible building boom going on. This morning there was a story about a tacky-looking shack selling for over 1 million buck. In this desert of dreams, condos and houses are going up in the least likely places,in fact, they’re going up any old place. Two experts I know, one an economist, the other a Midwest realtor, said when the building bubble bursts, it will start in Vegas. 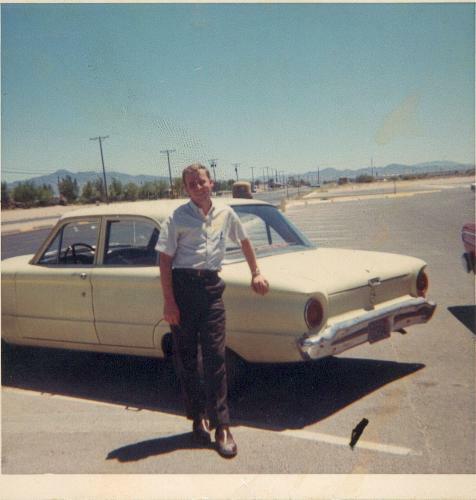 The first time I visited Las Vegas was with my father in the late 1960s. There was no terminal. We stepped off the plane in the searing heat and walked across the field. I don’t recall any large buildings. I was there because a high school friend, Danny, had asked my father for my hand. Danny was going to UNLV in Vegas and worked as the assistant to a state senator. Danny was a sweet Catholic boy who had been kicked out of Sacred Heart in San Francisco for playing too many pranks. He ended up at Lincoln High School where I was going and that’s how we met. We didn’t marry. (PHOTO, Below, right. This is Danny in Vegas, back when. I always wanted to be a writer and he once said, “I hope I get a chapter in your book.” Well, Danny, I hope a graph is okay for now. I’ve been to Vegas many times since. Burt was there even earlier, when the Stardust was being built, or another hotel with a romantic history. When Burt and I were there over the weekend, we took a cab to the Mandalay Hotel’s Convention Center. Our cab driver was a woman from Eastern Europe, very interested in world politics. Like the Irish fellow we met on board the Southwest flight, she loved America and never wanted to go back to Europe. She had lived in Italy, a beautiful place, but said you can’t find a job there unless you know somebody. The police was a good place to start, she said. I don’t know if you’ve seen those Vegas convention centers but the one at the Mandalay is mammoth. Long, long halls, long, long walks. Everything is extra large in Vegas. Somewhere along our travels we learned that Bill Clinton was coming to town, staying at the Bellagio for a fundraiser. Yeah, I gambled at the Venetian, where we stayed on the concierge level, both a lovely and quiet experience. I favor the slots but most of them don’t crank out real coins anymore. You get a piece of paper and I guess this is an extension of the cashless society. While the paper is printing there is the recorded sound of coins coming out–I like the slots because it’s mindless work that cleans out the “mind’s disk”. To wrap up, we were picked up by a friend who was taking us to his brother’s home to look at some things he wanted appraised. His 70-year-old brother had died a few months earlier–for decades he had been a casino manager. It was clear that the 1970s was the peak of this man’s life. 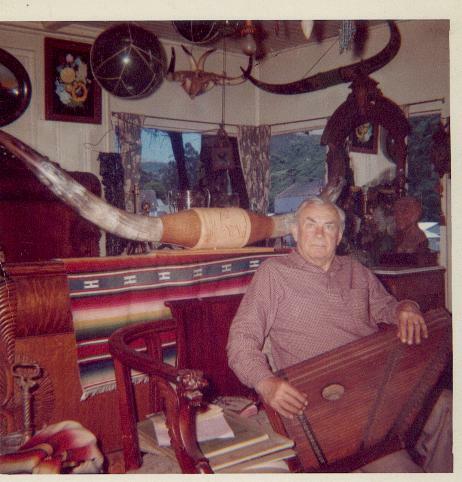 The house was built in the 1970s, and, as a single man all of his life, his home underlined that sort of lifestyle. I could see it as a partyhouse. His car, though a late model, had the furry seat covers. There was a photo of him with that fluffy hair look. The ride from Vegas to the airport was fascinating but I’ve thought about it, and I can’t, not now, anyway, tell you about that conversation with the cabbie. Another time. In time for Halloween: –I see that Chris Fleming has perhaps caught a photographic glimmer of the famous ghost at the Moss Beach Distillery. Home of the Ghost? 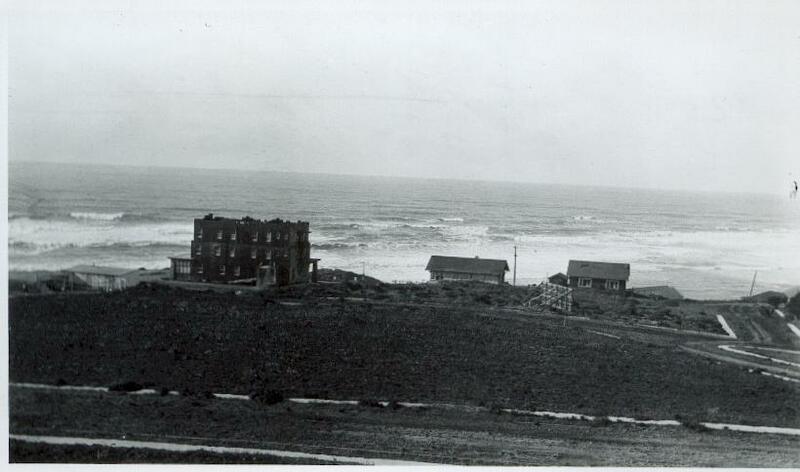 Moss Beach Distillery was built in the late 1920s. 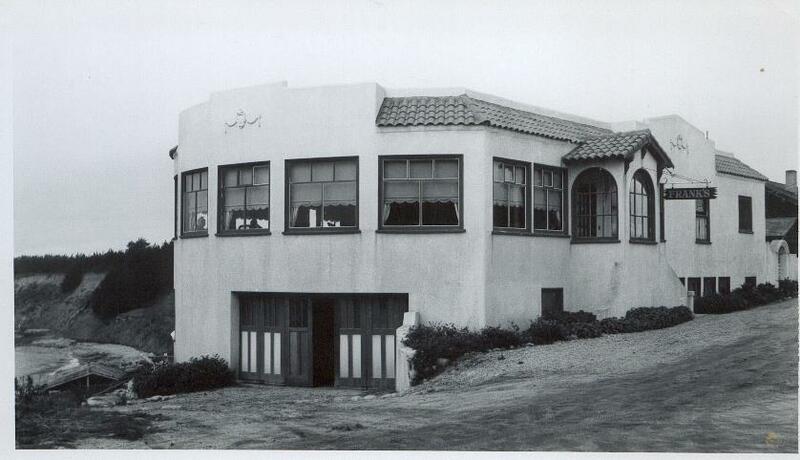 Montara writer Michael Smoolker has posted fresh Montara memorabilia and copy about Franks at Coastsider.com Take a peek. 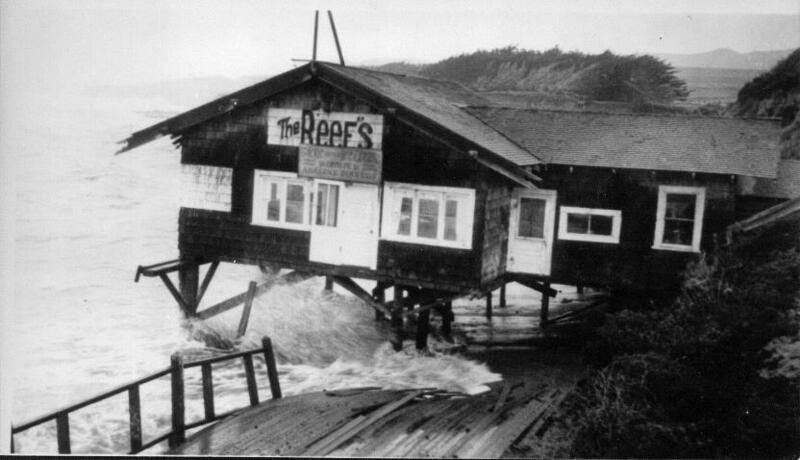 In 1980 I interviewed Charlie Nye, whose father, also called Charlie Nye, had owned a wonderful restaurant called The Reefs in Moss Beach. It was unique, a foundation-less building with piers stuck in the sand. 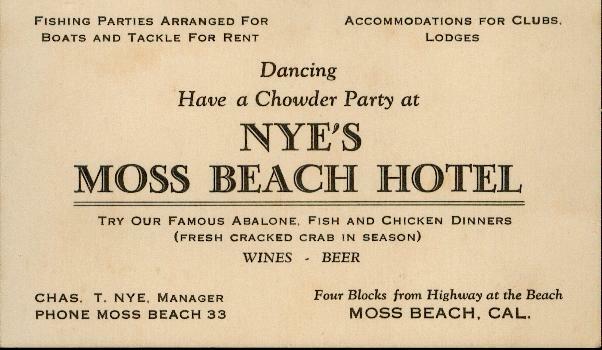 People came from all around to boat, collect shells and enjoy a bowl of ab chowder. The Charlie I talked with lived on the cliffs above the spot where the Reefs once stood. 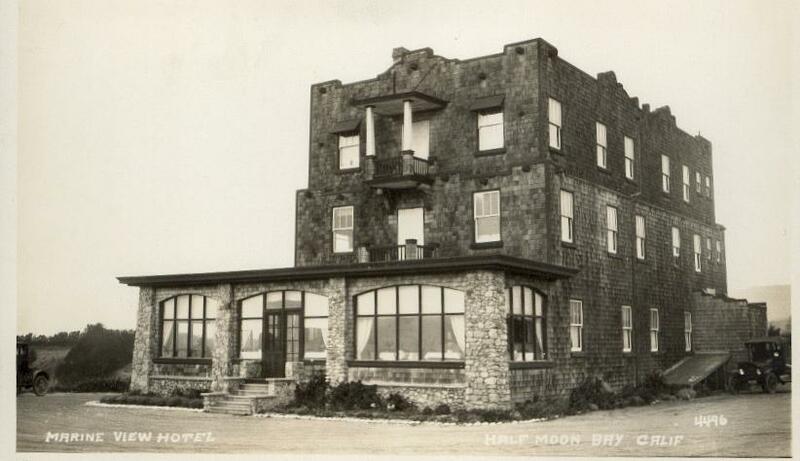 His place was called the Reefs II and across the way was another building that served as the Moss Beach Hotel. 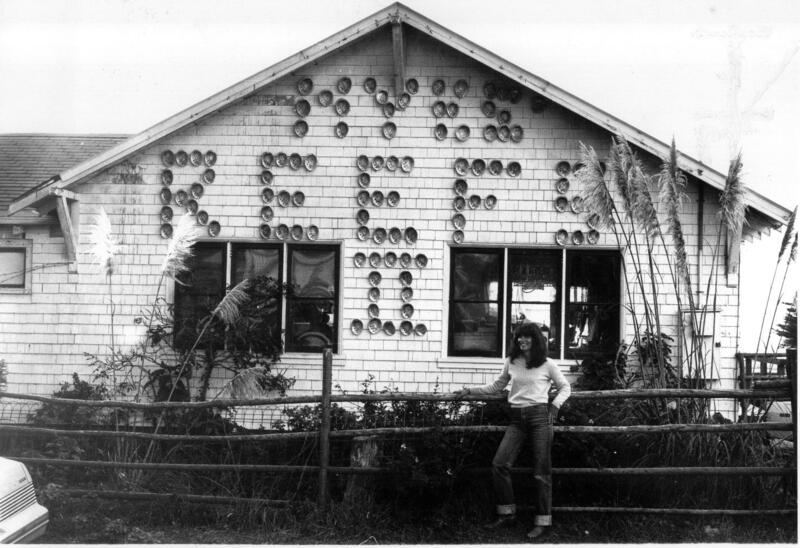 Mother Nature kept reminding Charlie Nye, Sr. that the Reefs was a temporary building. Every time the tide was high the waves splashed against the Reefs. When it was stormy they lashed angrily at the building, wearing it down and tearing into the cliffs behind it, too. Charllie Nye, Jr.: Finally there was a tidal wave and it lifted the Reefs off its pillars. But Nye had anticipated this moment and already built the Reefs II on the safer cliffs above. Charlie Nye, Jr.: This was completed, I think, in about 1926. Rooms were rented out to fishermen and people from the Valley who came when it got too hot. The Valley wasn’t air conditioned in those times. They came down for a month at a time. 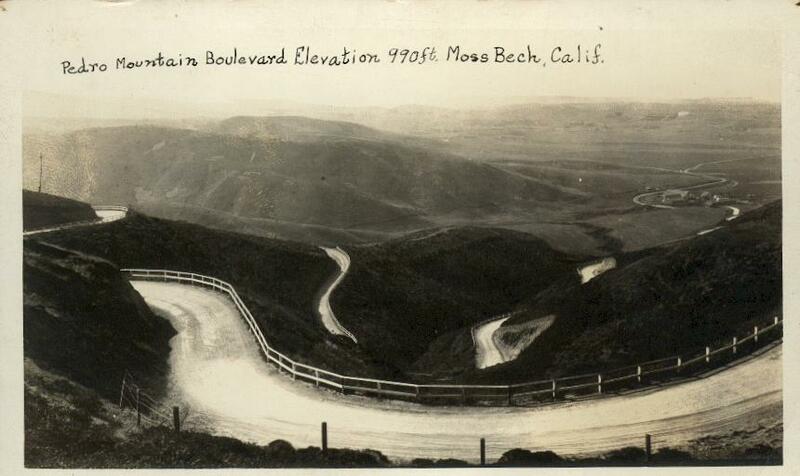 Getting to Moss Beach from anywhere in the 1920s was frustrating. Charlie Nye, Jr.: The road coming over Pedro Mountain was terrible, just awful. Words can’t describe it. It was just impossible. It went around turns and more turns, hairpin turns, short turns, backward turns. There were potholes on top of potholes. When you come down here today and complain about a few earth-slides on Devil’s Slide, well, that’s nothing compared to that old Pedro Mountain Road. June: Any other memories of transportation in those days? 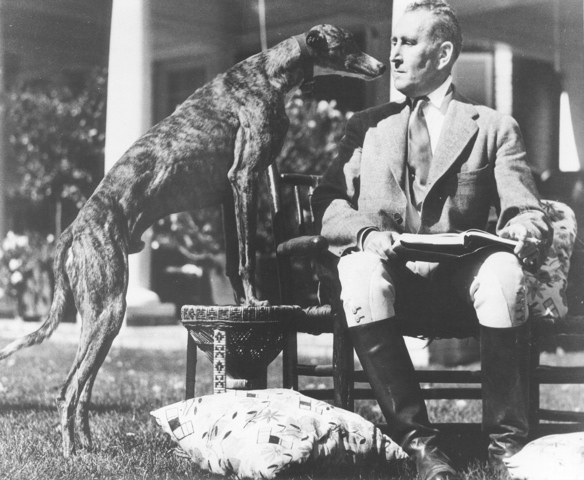 Charlie Nye, Jr.: I remember my father talking about the horse and buggy days. He said it took a full day to ride from San Mateo to Moss Beach. He said it could take four to five hours with a horse and buggy to haul lumber from Half Moon Bay to Moss Beach. Charlie’s father loved his work. Charlie Nye, Jr.: He ran the Reefs II until he was so blind that we forced him to stop. That was in 1967. He stopped serving food in 1965. When I interviewed Charlie in 1980 the Reefs II was open on Saturday and Sunday–not for food but for conversation in an eccentric, historic environment. Charlie Nye, Jr.: Curiosity seekers are coming in constantly. They say, ‘I didn’t know this was a bar. It doesn’t look like a bar. I often wondered what this place looked like. It looks like a curiosity shop’. The Reefs II, as many knew it, doesn’t exist anymore–and I believe Charlie Nye has moved to Mexico. 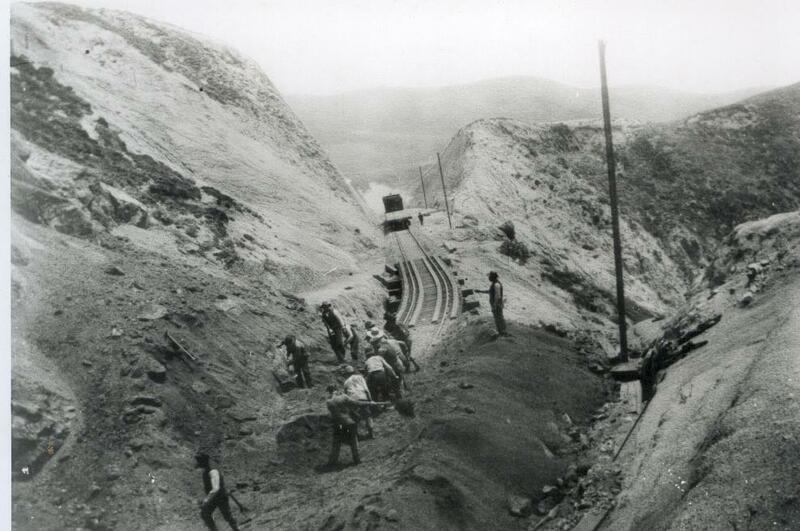 Working on the Ocean Shore Railroad, somewhere along the line, maybe at Devil’s Slide? In 1978, a few days before the famous Alves Dairy, south of Half Moon Bay, famous for its delicious chocolate milk, closed its doors forever, I had the opportunity to interview owner Ernie Alves. Ernie Alves was telling me how he recalled, with accuracy, the construction of a milk plant. The way he remembered, he said, was because WW II began, and he couldn’t forget that time. There were two German bricklayers working for his family and the war directly affected these men. Ernie: They passed a regulation that any aliens–Germans, Italians and Japanese could not cross west of the white line. (The white land separated the west side of the “highway” from the east side). The two bricklayers were German and they couldn’t come to work anymore. The man who ran the bakery was Italian and he couldn’t go to work, but his sons who were born here, could. It was a terrible when Coastside residents without American citizenship could not cross Main Street to buy groceries or eat dinner or hug their friends. Although the bitterness of those times has carried over until this very day, everyone was relieved when the war ended. Ernie Alves said his family processed raw milk until 1946. Then, he noted, the county and state passed a law requiring milk to be pasteurized. Drive-ins had caught the imagination of the post WWII consumer; they were novel and helped usher in the fast food conept. 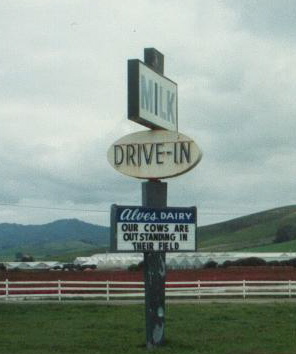 About 1962 the Alves family built their own drive-in dairy south of Half Moon Bay. Ernie: That is to say, Alves explained, if you had a herd and you had your own store you could sell milk for two to three cents lower than the prices a store could at that time. The state had complete control of prices. We were open six months and they changed the law. We had to sell at the same price as the stores. So soon they had lost their competitive edge–and that was the beginning of the end of drive-ins. In 1941 the Alves Dairy sold milk for ten cents a quart. They could turn a profit on that–but by 1978 it had become impossible and that was a big reason why the dairy was closing down. Ernie: We built this place and we had to borrow. We’ve been forced to lower our price per gallon,which to me is utterly ridiculous. I would like to take those people and give them our operation for six months and see what they can do. They’ll probably be slaughtering cows to eat. 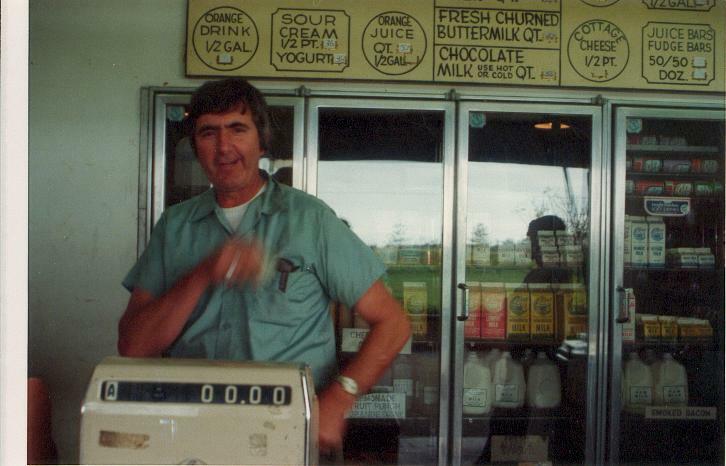 Now the closing of the Alves Dairy was a few days away. June: How do you feel? Ernie: It seems strange but I’m also kind of glad to get away from it. I’ve got a lot of irons on the fire. Although the dairy closed, the “Our Cows Are Outstanding In Their Field” sign stayed up for awhile longer, then it, too, vanished forever.